Product prices and availability are accurate as of 2019-04-01 18:23:33 EDT and are subject to change. Any price and availability information displayed on http://www.amazon.com/ at the time of purchase will apply to the purchase of this product. Here's everything you need in a grinder! 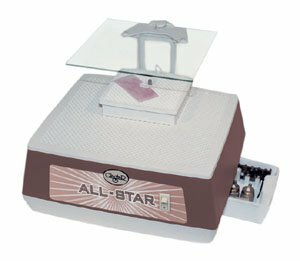 This extremely durable, professional grade grinder features a built-in water pump, mini table for grinding small pieces, 1/9 HP motor, and a work surface that is 11" x 13", or 20% larger than most other grinders. Keep your eyes safe with the large 8" x 9" scratch resistant eye shield lens. Also includes 1" and 1/4" bits, built-in accessory drawer, roller-type adjustable straight edge guide, convenient coolant drain and flexible rubber splash guard. Comes with a full 5 year warranty.